Wake up and dream: The Living Universe - We recognize ourselves as intensification of aliveness! The Living Universe - We recognize ourselves as intensification of aliveness! 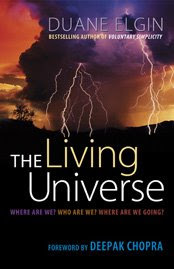 Duane Elgin, author of "The Living Universe" was just interviewed in EnlightenNext Magazine. "Q: Why do you feel it's important for people to develop this understanding of the universe as living?" "A: Until recently, the dominant cosmology in contemporary physics held that since the big bang nearly fourteen billion years ago, little more has happened than a rearranging of the cosmic furniture. This dead-universe theory assumes creation occured only once, when a massive explosion spewed out lifeless material into equally lifeless space. Life somehow mysteriously emerged as nonliving atoms inexplicably organized and grew themselves into ever more complex forms. In this scenario, who we are and life itself are meaningless. We're just a speck of aliveness in a vast ocean of deadness, and when we die, we just sink into oblivion." "But now science is starting to say , 'Wait a minute. We're living in a continuously regenerating system, and there are extraordinary amounts of life just pouring through all of it.' From this perspective, we see that the whole of existence is alive, and when we die, we die into this vast ocean of aliveness. We're beginning to recognize how extraordinary we are as a species and that what really matters is the extent to which we recognize ourselves as the intensification of that aliveness. Do we exist in a reality that has no meaning, or do we see ourselves in this much larger context? It matters enormously whether we're just playing biochemical games or we're authentically connecting with the deeper aliveness that permeates the universe."